Sign Up Today and Get your $12,000! Visit Live Hold'em Sign Up and Get your $12,000! If you are searching for a solid, slick and nicely populated poker game to satisfy your poker gaming itch, then you shouldn't look any further. Live Hold'em Pro brings all the poker room fun to you at your fingertips. You won't have to go to an actual real money gaming site to actively participate in the excitement that comes with this popular table game. This social gaming app has been serving poker players to their fill ever since it was developed back in 2010 by Dragonplay, a multi-platform development house that specializes in social and mobile betting games. As you may already know, Texas Hold'em is by far the most popular poker variant across the globe and this social gaming site adds a jolt of extra fun and exhilaration by allowing you to play with your friends. This Live Hold'em Pro review is an in-depth outlook at the strengths that make this game as popular as it is today and perhaps a couple of weaknesses that gamers like our reviewers have noted during gameplay. Brace yourself for an informative read in the next couple of minutes in our Live Hold'em Pro online review. If you are a true fan of poker, but aren't really looking to risk your hard-earned cash on real money games, Live Hold'em Pro is the game you should start playing right away. First of all, it's a free social gaming app whose main focus is to help you have as much fun as possible placing wagers in the most popular poker variant. A lot of cool and impressive features are waiting for you on the other end. Do you already have a Facebook account? If so, then you are in luck because you will not have to go through the tiring process of creating an account. You can go straight to the game using your Facebook details. The graphic interface is clean and extremely intuitive. You won't need extra help to navigate through the menus. Everything is right where it needs to be for easy access and fast action so that you don't lose a second to thinking about where you need to go next. Without a doubt, this is among the best social gaming sites that you can get anywhere online. The main feature that makes this game different and more entertaining as well is that when you start playing, you are placing wagers against real players and not just a computer. That exclusive feature makes the thrill way more captivating because you have to keep up with the pace of fellow players. Continue reading this informative Live Hold'em Pro mobile review and find out what's in store for you. Again, another aspect that has given this game its massive reputation is mobile compatibility. 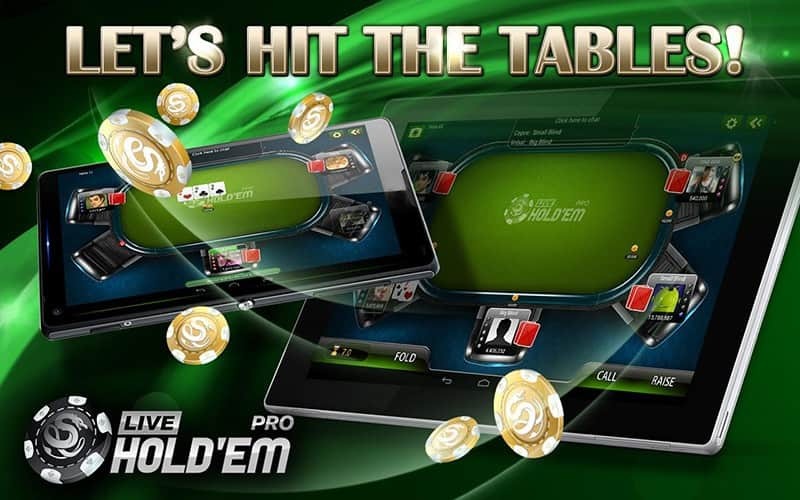 Live Hold'em Pro is available on all major mobile platforms, i.e. Android and iOS. If you have an iPhone, iPad or an iPod Touch device, just download the free app and you can start enjoying the game in less than two minutes. For Android users, the game will play smoothly on all your devices such as the Huawei P9, HTC M8 and the new Google Pixel smartphone. Sony Xperia tablets and Samsung Tabs are also compatible with this game. Users of the Kindle Fire tablet and Kindle pro devices have also been catered to with a dedicated Amazon mobile app. In short, as long as you have a mobile device with Android, iOS or Amazon, you are good to go! On the other hand, if you use Windows based devices such as the Surface Pro 3 or the Microsoft Lumia smartphone, worry not because you can use the dedicated Facebook app. During our Live Hold'em Pro online review, it was clear that no one is left out in this amazing social gaming app. As we went on with our Live Hold'em Pro review we were pleased to find out that 99% of the time, the gameplay was exceptionally smooth and the awesome interface kept things interesting. There were no glitches whatsoever, even with a temporary loss of network. During tournament play, here are the most outstanding aspects that you will find when you hit the ‘Play' button. No matter when you want to play the game, there is always a tournament or a free table that you can join. Unlike some other social gaming sites, you will not have to sift through hordes of servers just to find the perfect spot to spend your virtual currency. In fact, there is even a “Play Now” option included where you are immediately placed at a table. If you just want to take a short break from work in a quick 10 or 15 minute game, you can choose your level of entry fee and you will be placed on a table that has 4 other players in a high-stake winner takes all session. Here, you can play quick card games on Fast-Fold poker tables in high-speed exciting poker action. There is also a live chat feature where you can communicate with fellow players within the game so that you can learn some helpful tips to improve your gameplay. Furthermore, if you are impressed by the prowess of any of your opponents after the game, you can send them $200 or more in free chips. How cool is that? Live Hold'em Pro accepts in-app purchases from globally accepted secure payment options such as Visa, American Express, MasterCard, Discover, JCB, UnionPay and Maestro. E-wallets such as PayPal and Google Wallet are also accepted. The winnings here are not redeemable as real money because this is a social gaming app. Therefore, there are no real cash withdrawals. play for real money. All the in-game cash is virtual currency exclusive to this game alone. To keep you hooked to this game, there are a variety of lucrative offers that you are awarded from the first moment you create an account. Some of the bonus offers available are shown below. There is a nice welcome bonus package of $12,000 that you can use to take part in your first tournaments of the game. These free chips will help you play more and earn more. For every day that you log into the game, you will receive login bonus rewards of $5,000 in chips to encourage you to keep playing. After every 4 hours that pass, you are automatically awarded $1,000 in free chips. So, you just have to log in after that period to get the reward. Jackpot Lottery draw is available so that you can have a chance at multiplying your in-game cash. Join the draw and test your luck! 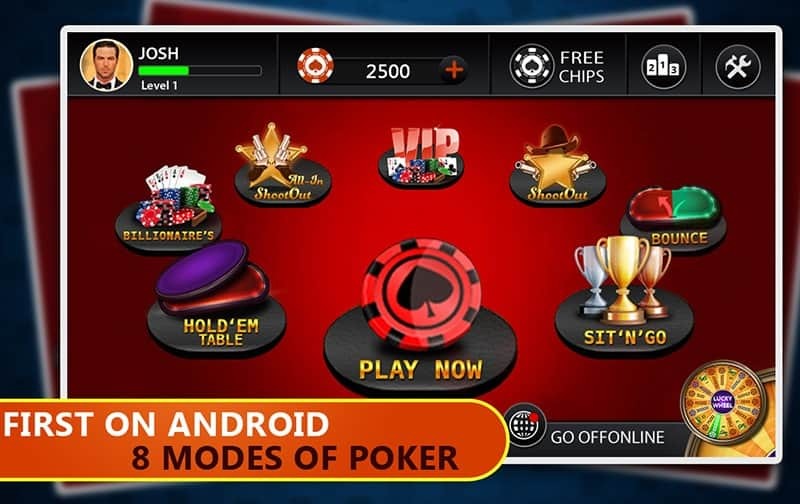 Sure enough, Live Hold'em Pro deserves the top spot among all the other social gaming sites out there. Our thorough Live Hold'em Pro online review confirmed that this game is worthy of being a respectable poker game in the market thanks to its feature rich interface, amazing gameplay and lucrative reward system. You are given a chance to select tables that match your skill level for competitive entertainment without losing loads of cash in real money wagers. The packages available to top-up your game bankroll come in affordable rates so you won't have to worry about spending too much money. In fact, the constant rewards will also keep refilling your stash. The only issue perhaps is that you might find yourself spending hours glued to the thrill on your screen! Visit Live Hold'em Sign Up Today and Get your $12,000!